To deliver on our strategy for the future: To simplify our Client’s supply chain, increase flexibility and greatly reduce time to market. This is supported by our already resilient processes around our technology and provides further assurance to our Clients. We are covered for the “Provision of the Information Technology infrastructure, operations and data centre service management for Blue Star DIRECT’s Business Process Outsourcing services including Digital Technology delivery”. This covers all our systems, processes and people. 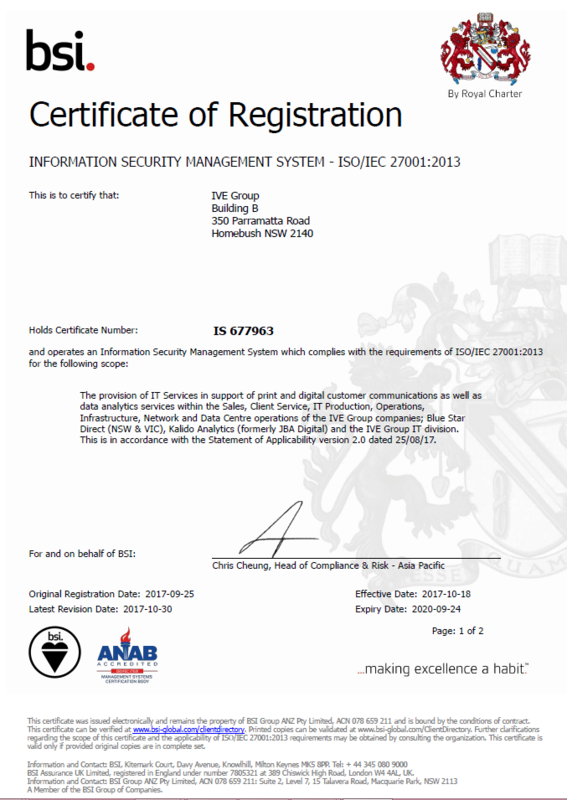 Through this commitment, we are continually improving information security and business continuity and minimising exposure to risk for our Clients in the delivery of our services to deliver marketing and business messages to our client’s customers anywhere, anyhow, to any device, at any time.